Perthshire Society of Natural Science | Environment, Nature and Cultural Heritage. Each Section organizes its own series of activities and you can find the programmes listed on this site. 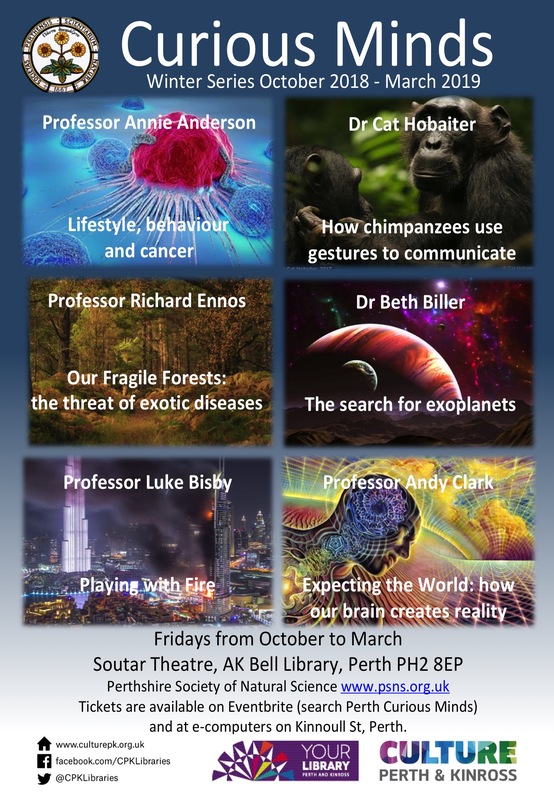 PSNS also runs a series of public lectures on Friday evenings from October to March in partnership with Culture Perth and Kinross. The talks, called “Curious Minds” explore the theme of Contemporary Science in Scotland. We invite speakers from Universities and other Research Institutions to come along and tell us about their work – with no jargon and no complicated equations. We have enjoyed two very successful seasons with talks ranging from mud houses in Errol through the physiology of seals to black holes and the Higgs boson. As one of our guests said “It’s like going to the gym – for your brain”. We have a great programme for 2018/19, with 12 speakers lined up covering a wide and eclectic range of subjects. You can find full details of the 2018/19 programme, with ticket information, on the Curious Minds page. A summary programme of all winter lectures, including the meetings of the Sections, can be downloaded here psns-full-programme-2018-19.